Ice Age: Collision Course, the fifth installment in this lamentably long-lived animated franchise, is the last Ice Age movie I intend to see. In a way, this review is superfluous. That’s because Ice Age: Collision Course isn’t a movie. Oh, it’s projected on multiplex screens but it is, at best, an oversized, overbudgeted Saturday morning cartoon. Younger kids will have fun with the movie. It’s in their wheelhouse. The juvenile jokes will amuse them and the braindead storyline won’t confuse them or hinder their ability to enjoy the subpar 3-D and cheapish animation. Adults - well, that’s another story. Admittedly, this isn’t made for people over the age of about 10. But most children need adult accompaniment to attend a movie and, in this case, the sacrificial lamb can add another thing to the list of “things I sacrificed to have kids.” I found the experience nearly unendurable and was fighting the urge to take a nap. Finding Dory is still in theaters. So is The Secret Lives of Pets. Both have their flaws but they are real movies. 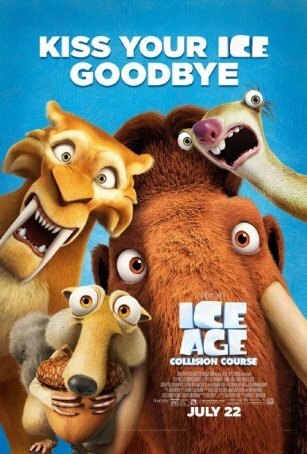 Compared to them, Ice Age: Collision Course is an embarrassment. It’s a cash grab of the most crass kind, using the lure of familiar characters and a marketable name to fill 20th Century Fox’s coffers. The movie’s story doesn’t try to make sense because, well, what’s the point? We’re so deep in cartoonland here that all but the most rudimentary aspects of the narrative have been jettisoned. This is about wisecracking, anthropomorphic animals and disaster film clichés. Everyone is back, which isn’t necessarily a good thing. The main Ice Age trio of Manny the Mammoth (voice of Ray Romano), Sid the Sloth (John Leguizamo), and Diego the Sabertooth Tiger (Denis Leary) were never that exciting to begin with and familiarity had not made the heart grow fonder. They are rejoined by Manny’s family - wife Ellie (Queen Latifa), grown-up daughter Peaches (Keke Palmer), and soon-to-be-son-in-law Julian (Adam Devine); Deigo’s wife, Shira (Jennifer Lopez); and Sid’s granny (Wanda Sykes). Simon Pegg’s Buck is also back, meaning that, aside from Julian, the only newcomers in chapter five are lesser figures like Neil deBuck Weasel (Neil deGrasse Tyson), Shangri Llama (Jesse Tyler Ferguson), and Brooke a.k.a. Sid’s overdue love interest (Jessie J). Also returning, of course, is Scrat the Sabertooth Squirrel. This Wiley Coyote-inspired creature with bug eyes and a desperate love for acorns has been one of the high points of the Ice Age saga. Scrat’s segments, disconnected vignettes reminiscent of the old Looney Tunes shorts, have not only offered amusing interludes from the more staid activities of the speaking characters but have featured heavily in the marketing campaigns. This time, however, even Scrat is showing signs of becoming stale. In Collision Course, he’s chasing an acorn in outer space and on a space ship and the level of inventiveness and manic energy associated with his past exploits is missing. Although the trajectory of the Ice Age films hasn’t been consistently downward, Collision Course is the worst of the batch. With all due respect to co-directors Mike Thurmeier and Galen T. Chu (both of whom worked on earlier Ice Age films), this one feels not only obligatory but lazy. I understand that in today’s movie-making economy, lucrative productions must always have sequels. But there’s nothing that says the sequels have to be flat, lifeless, and creatively bankrupt. Disney and Dreamworks consistently churn out product that’s as enjoyable for someone age 40 as it is for someone age 4. No one will ever mistake Ice Age: Collision Course for one of those movies.